Sony has released PlayStation 4 PRO to be the most powerful game console in the current history, equipping it with the latest technologies that take this console to the top level of professionalism. The CPU is now more solid to the extent that it can seamlessly process heavy workloads of high-end games much faster. The GPU is mighty enough to handle 4K UHD resolution games and movies flawlessly, and the data bus interface has been upgraded to Serial-ATA rev 3.x (aka SATA III), so as to offer the highest possible data transfer rate from/to the internal storage device. However, this mighty game console doesn’t come free of any drawback, especially that relates to the internal hard drive’s performance which is disappointing enough to someone who bought this console and expected the utmost from it in all aspects. In order to work around this issue and to suggest to our readers the best solution that precisely matches their needs, we have compiled this comprehensive guide based on an in-depth research, hoping that it becomes the most complete reference for this subject in which readers can find answers to nearly all their questions without the need for any other resource. We also make sure that this guide is regularly revised to keep its information “living” and up-to-date. Just a last note before we start. We strongly advise that you fully and carefully read it. It’s, indeed, worth every second of your time if you really don’t want to waste your money or efforts in an option that either does’t suite you well or there’s a better alternative to it. Before making any step concerning any thing, you need first to have at least a general idea that covers the major aspects about this thing. That way you make sure you are making solid steps in your pursuit and you are on the right path. In our case, the first step to make is to know the specifications of the stock internal hard drive (HDD) of PS4 PRO. If you open the PS4 PRO drive cage and pulled out the hard drive, you’re supposed to find a drive with a similar front label (click the image to enlarge it). This is the main culprit of all your storage problems with PS4 PRO. You have to either replace it with a new drive or just expand its capacity with an external storage device. (You’ll learn how later in this guide). It’s intuitive to realize that this storage device type used inside PS4 PRO box is just the same as the one used in laptop computers. So, there’s really nothing special in it. There are two physical methods to expand PS4 PRO storage capacity, each comes with its advantages and disadvantages that are thoroughly addressed in the method comparison section. There’s also a virtual solution via the 1 GB cloud storage space offered to every PS4 Plus subscriber which we are not going to discuss here in this guide. Internal Storage Upgrade, with which you replace the internal stock storage device of PS4 PRO with another. External Storage Upgrade, with which you keep PS4 PRO stock hard drive untouched, but rather support it externally with a storage expansion add-on. PlayStation 4 PRO allows its users to replace/change the stock internal hard drive with a new drive as long as it meets the compatibility standards. Internally, without any additional external equipment (for 3.5″ drives only), you can upgrade the stock hard drive to up to 2TB with HDD or SSHD, and up to 4TB with SSD (which is way too expensive). Hard Disk Drive (HDD). It is the traditional mechanical drive that’s same type as that of stock storage device. Solid State Drive (SSD). Non-mechanical, flash-based storage device. It’s blazing fast and very reliable, but very expensive also (almost 5 times more costly than HDD). 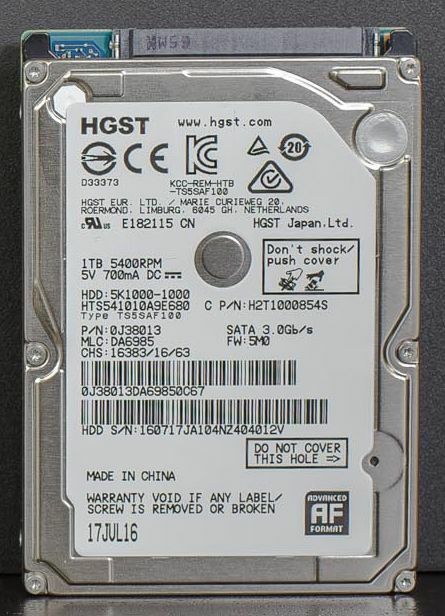 Solid State Hybrid Drive (SSHD). It’s a combination between SSD technology and HDD, trying to be a compromise between speed, capacity and price. It’s the type of drive that we strongly recommend to the overwhelming majority of users. Let’s go into some details about each option here, whereas the long details are separated in specific articles. When choosing a new replacement hard drive for your PS4 PRO storage upgrade, you need to make sure it’s larger and performing better in terms of speed and reliability. Otherwise, it’s a waste of investment and makes no sense if you upgrade to a drive that doesn’t offer any reasonable advantage over the stock drive. The buffer/cache memory should be at least the double of your current drive. This type of high-speed memory technology significantly increases the data transfer rate from/to the hard drive. The larger, the better performance the drive is. Whenever possible, make sure the new drive has a higher spindle speed. The standard speed is now 5400 RPM in almost all modern 2.5-inch form factor hard drives so as to maintain the top level of reliability in this compact size, as higher speed might impact the performance especially in portable environment, which this type of hard drives are primarily designed for. But, at any time, if a new hard drive has been released with a higher speed, you must give it a priority. The drive’s brand has to belong to a highly-reputed manufacturer in the HDD industry and not just the data storage space. You can, for instance, trust Seagate here but cannot trust OCZ or SanDisk, although both are prominent SSD manufacturers. The only three manufacturers you can trust are: Seagate, Western Digital and Toshiba. Year of manufacture. Always pick the newest releases as they are supposed to implement the latest and best technologies that improve the overall performance. Length of Warranty. Don’t go for less than 2 years. Almost all modern storage devices offer a 2-year limited warranty by default. Otherwise, if you insist on getting a classing hard drive, our top recommendation in this regard is: Seagate Barracuda 2TB HDD [ST2000LM015], which is the newest and most efficient 2.5-inch hard drive on the market as of today, with 128MB of buffer cache and 5400RPM spindle speed. The concept of an SSHD is basically about merging the technology of traditional HDD and that of flash-based SSD into one unit in a pursuit of gaining a double advantage. To some point, an SSHD has succeeded in its goal. Just don’t expect to get the full speed of an SSD as advertised, as that small portion of SSD is a part of a caching system, but you still get a considerable performance boost much better than an abstract traditional hard drive. According to tests conducted on SSHDs, a particular application needs to run at least 5 times before it’s cached into the SSD memory to get the performance boost. Otherwise, the performance of this application on the SSHD is no different than that on a regular HDD. The most important part in an SSHD is the caching system which gives it the advantage over classical hard drives. Therefore, in addition to what’s stated above on how to choose a new HDD for your PS4 PRO, make sure the buffer and SSD cache are relatively large. Currently, the best SSHD manufacturer is Seagate, and our top recommendation for PS4 PRO is Seagate FireCuda Gaming SSHD 2TB. (For a quick overview on this drive, please click here). SSD is undoubtedly the most perfect data storage device ever. It surpasses regular HDD and SSHD in all tests concerning performance and reliability. Its only disadvantage is the high price it comes with. While a 1TB HDD costs $45 or even less, a 1TB SSD costs $200 and more. If the price is of no concern to you, we strongly advise of an SSD for PS4 PRO. With the powerful CPU and SATA-III interface, an SSD would take the overall system performance to the next level. We don’t recommend a high-end SSD (like Samsung 850 PRO) for PS4 PRO because these SSDs are basically designed for intense multitask environments under heavy workload pressures which any game console, no matter how powerful it is or how it’s used, can’t reach that level of data processing intensity that kind of SSDs is mainly designed for. Therefore, it’s a waste of money to go for such an SSD. One of the very good SSDs that we recommend for PS4 PRO is SanDisk SSD PLUS 960GB. It’s a reputable brand in the SSD industry and comes with a reasonable price for an entry-level SSD (almost $260 as of the time of writing). The brand is highly reputable. There are many high reputation SSD brands in the market, such as Samsung, Toshiba, OCZ, Crucial, Plextor, SanDisk, Mushkin and few others. Just make sure the brand has a clean history in the industry, in order to relax that the SSD you are getting is of high quality. Year of manufacture isn’t before 2015. That way you make sure the latest and most efficient technologies are implemented to offer the maximum performance level. Sequential Read/Write speed isn’t below 500 MB/s. This speed is the standard for SATA III SSD anyway, so you’ll barely find any new SSD offering less than that, even from low profile companies. Warranty period is at least 3 years. This period is also a standard in modern mainstream SSDs. High-end SSDs offer up to 10-year limited warranty. If you’re interested in more details on this matter and want to view more SSD options, please visit our PS4 PRO SSD Guide where you’ll find rich information that help you make the right decision in this regard. After the release of PS4 Software Update version 4.5 (on Mar 9, 2017), an external storage device can carry out the same functions as the internal. Previously, PlayStation 4’s operating system limited the use of external storage devices on backup purposes only. But with the hail of complaints and requests from users, Sony finally yielded to the pressure and now you can do everything you wish with an external storage device, such as installing and playing games and streaming movies from it. That said, the external storage device is now a complete storage expansion to the internal sibling, and with it you can simply dispense with swapping the stock hard drive, which makes life much simpler. You might even prefer this method if you get to know that experiments show unexpected better performance of games on an external hard drive than that with the internal, and that’s quite amazing. For more elaboration on this topic including our top recommendations of compatible external storage devices, please visit our PS4 PRO External Hard Drive Guide. PlayStation 4 PRO supports USB 3.1 (Gen 1) with one port on the rear of its body. Therefore make sure your external storage device supports USB connectivity as well. As for the system file type, generally it should be exFAT, then you can use it for backup purposes only with PS4 PRO, and you can then use the same device on PC or MAC or any other system. But if you are using your external storage device for playing games and movies, you have then to format it using PS4 PRO format utility that will totally encrypt (i.e. acquisition) your device and won’t allow you to use on any different system (PC or MAC). To see how to format an external storage device for PS4 PRO as an extended storage, visit our guide here. Traditional External Hard Drive (HDD). It has two types: Portable, which utilizes a laptop 2.5″ hard drive, and Station, which utilizes a 3.5″ hard drive offering higher speed. External Solid State Drive (SSD). Usually comes in a portable form, and the station drives are designed for the enterprise use and it’s so costly. USB Flash Memory. Due to its limited storage capacity, it’s not a good fit as a storage extension. It’s usually used for emergency cases, like resetting PS4 PRO and storing game saves. We’re not going to discuss each of these options here with some details like we did with the internal storage devices, because this guide is basically about internal storage upgrade and we already compiled separately a comprehensive guide on this topic (click here to view it) enriched with valuable pieces of information that will help you get an overall picture of the whole subject and thus make the right decision in this regard. It’s important to realize what advantages and disadvantages each storage expansion option has, in order to gauge your expectations accordingly. Compared to the external storage expansion solution, upgrading PS4 PRO stock hard drive by replacing it with a new internal storage device has its advantages and disadvantages. Note that the most significant advantage of this method stems from the fact that the internal storage device is an essential part of the PS4 PRO build, and you are forced to deal with it, whether you like it or not, even if you’re not going to install any games or store any movie on it. PS4 PRO operating system and its core applications only load from an internal storage device. So in order to boost the overall system’s performance, you have to have a fast internal storage device that helps the operating system and its core applications load faster alongside with the internally stored games and movies. You can use an SSHD for the upgrade which’s not available as an external option. An SSHD is the best storage upgrade option for PS4 PRO in terms of capacity, speed and price altogether, as explained previously. To enjoy its solid features, you have to use it internally only. With the new firmware update (4.5), it’s now possible to store movies on the internal hard drive by importing them from an external USB storage device. That’s all. Otherwise, the rest of advantages you’ll get from upgrading with an internal storage device you can get with an external storage device as well. That’s why we’ve not listed them here, as they are not special. You have to re-install/restore everything, including the operating system, which is kind of time consuming. The data transfer speed is limited by SATA III interface specs, which means it cannot exceed 6.0 Gbps, unlike external storage devices that enjoy a high data transfer rate via USB 3.1 (Gen 1) up to 10 Gbps. You can read more on PS4 PRO internal hard drive upgrade in this comprehensive guide. After the release of PS4 Software Update (v 4.5) the external storage extension works almost the same as an internal storage upgrade, except in handling the operating system and its core applications. Therefore, from this premise you can simply deduce the advantages and disadvantages. Hassle free—No mechanical or technical work needed. You don’t have to unscrew the internal hard drive, remove it, place another drive and fix it, then later restore the whole operating system with its games. With an external storage expansion solution, with just a few clicks that don’t take 10 seconds you can get the drive ready to use and work as a complete storage solution for the console. High data transfer rate up to 10.0 Gbps via USB 3.1 (Gen 1), which is much faster than SATA III rate that’s limited to 6.0 Gbps with which an internal hard drive is configured. This might not be a real advantage for most external storage devices unless it’s a RAID-0 super-speed external SSD, because, currently, the fastest external storage device can’t hit the maximum transfer rate of SATA III. Unless you’re careful enough, an external device generally is not very safe as an internal entity. It’s more subject to loss or even defects due to misuse, especially if it undergoes intense shock or vibration as a result of a tough fall. It will be exclusively dedicated to PS4 systems, and you cannot, therefore, use it on any other system like MAC or PC. That’s because PS4 PRO system software would format and encrypt it in order to get it totally merged into the system as a fully-compatible storage expansion solution. Occupies more space on the desk. It can be a real problem if you use a station external hard drive with an electrical cable. Otherwise, portable devices are small enough to cause no real issue in this regard. You can read more about PS4 PRO external hard drive in this comprehensive guide. But what about the performance? Will an external storage device perform better than the internal? Considering a few facts related to this issue, we can confidently say that it depends on what external and internal storage device you’re using, as it’s imperative that they’re used together. If your internal storage device is a mere hard drive, then using an external hard drive of the same type offers a better speed for games and movies. That’s because of the lack of multitasking feature in mechanical hard drives that allows extended latency and low IOPS, let alone the limited throughput they are known with. We won’t go too technical into this, and it’s sufficient to know that tests have proved this fact when using a normal external hard drive with the stock hard drive of PS4 PRO. But if your internal storage device is an SSD, theoretically, an external storage device, even if it’s an external SSD, won’t notably (if any at all) surpass the internal SSD. That’s simply because of the availability of multitasking feature and the high throughput SSDs boast. Additionally, the algorithm of PS4 operating system and its games is not made to handle too heavy data workloads resulted from the use of super-fast storage devices. Therefore the PS4 system imposes limitations on the amount of processed data per second. Even PS4 PRO games are not coded to suit this condition. As for hybrid drives (SSHD), using an external hard drive will benefit when the games you’re running from it is new. But if it’s a frequently-played game, then an SSHD will run it faster. That’s because the technology of SSHD is primarily based on caching the frequently-used data relying on user’s experience. Useful Tip: For the best results in terms of capacity and performance, try using a cheap small SSD (costs you around $50) as an internal storage device and a RAID0 4TB external hard drive to install and play your games from. Read more here. PS4 PRO storage capacity can be easily expanded, either by upgrading the internal storage drive with a new drive, or use the external storage expansion solution. This comprehensive guide has outlined almost all aspects you need to know before taking your first step in the way of upgrade. What’s the Best Replacement Hard Drive for PS4? Thanks for your comment. I think you’re right here. I am not sure from where that writer brought this information. I have to fix that myself soon after doing a little research. I read that PS4 PRO supports Max of 8 TB per drive. So I can use 2 external 4Tb drives in raid mode and get super crazy speeds. No you can’t. It doesn’t support RAID. I have an upgraded PS4 with a 2tb Firecuda in it. Today I bought a new PS4 pro and I want to just swap my Firecuda into my new Pro. Can you help me with this? I have a 4tb WD external easy store. I just need some specific directions. Any help is appreciated. Just insert the Firecuda inside your PS4 Pro, then initialize your PS4 and you’ll be fine. If that doesn’t work for any reason, just connect your firecuda to a PC and totally format it. The follow these instructions on how to upgrade PS4 hard drive.